In America as in Britain, the rise of the Gothic represented the other--the fearful shadows cast upon Enlightenment philosophies of common sense, democratic positivism, and optimistic futurity. Many critics have recognized the centrality of these shadows to American culture and self-identification. American Gothic, however, remaps the field by offering a series of revisionist essays associated with a common theme: the range and variety of Gothic manifestations in high and popular art from the roots of American culture to the present. 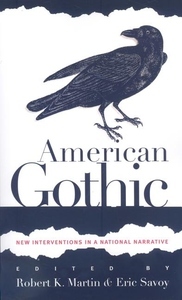 The thirteen essayists approach the persistence of the Gothic in American culture by providing a composite of interventions that focus on specific issues--the histories of gender and race, the cultures of cities and scandals and sensations--in order to advance distinct theoretical paradigms. Each essay sustains a connection between a particular theoretical field and a central problem in the Gothic tradition. Drawing widely on contemporary theory--particularly revisionist views of Freud such as those offered by Lacan and Kristeva--this volume ranges from the well-known Gothic horrors of Edgar Allan Poe and Nathaniel Hawthorne to the popular fantasies of Stephen King and the postmodern visions of Kathy Acker. Special attention is paid to the issues of slavery and race in both black and white texts, including those by Ralph Ellison and William Faulkner. In the view of the editors and contributors, the Gothic is not so much a historical category as a mode of thought haunted by history, a part of suburban life and the lifeblood of films such as The Exorcist and Fatal Attraction.